The PicoScope 9404-05 5GHz oscilloscope is a PC-based high-resolution device which brings an affordable high-speed performance by combining the benefits of real-time and equivalent-time sampling with high analog bandwidth. The PicoScope 9404-05 has four 5 GHz 50-Ω input channels, each with its own advanced 12-bit ADC, which provide the required timing and display resolution for accurately measuring and visualizing high-speed repetitive analog and data signals. This tool can capture pulse and step transitions to 70 psec, impulses down to 140 psec, and clocks and data eyes to 3 Gb/sec. The PicoScope 9404-05 has a built-in full-bandwidth trigger for each channel, with pre-trigger ETS (equivalent-time sampling) capture available to well above the Nyquist sampling rate. The PicoSample 4 software is provided at no extra charge and is derived from previous Pico products. It benefits from more than ten years of development and optimization. As they become available, new software features and updates are provided at no additional cost. Most high-bandwidth measurement applications tend to involve repetitive signals or clock-related data streams. These are candidates for analysis by equivalent-time sampling systems. The 9404-05 Sampler-Extended Real Time Oscilloscope (SXRTO), with acquisitions running at up to 2 million triggered captures per second, enables very fast signals to build up in the display quickly. The 9404-05 is compact enough to place on a workbench in close proximity to a device under test. Apart from the controlling PC, everything needed is built into the oscilloscope, with no expensive hardware or software add-ons required. 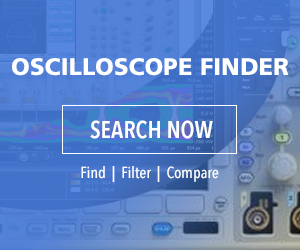 Made by Pico Technology, Europe’s award-winning test and measurement manufacturer, the PicoScope 9404-05 5-GHz oscilloscope is available now at $14,995 from Saelig Company, Inc. the USA technical distributor. For detailed specifications, free technical assistance, or additional information, contact Saelig 888-7SAELIG, via email: info@saelig.com, or visit https://www.saelig.com/product/9404-05.htm.